The National Testing Agency (NTA) has released the Joint Entrance Examination (JEE Main 2) April Exam admit card on its official website. Candidates who have applied for the JEE Main II can visit the official website of JEE Main: jeemain.nic.in to download the admit card. The admit card download link is now active on the official website. The candidates can download the JEE Main April 2019 exam admit card either through Application Number and Password or through Application Number and Date of Birth. The steps to download the admit card is also provided below. The second and last session of the Joint Entrance Exam (JEE) Main 2019 has begun t with paper-I, an entrance exam for admission to architecture and related courses. The exam for admission to engineering related undergraduate courses – B.E and B.Tech will begin on April 8, 2019. Admit Card: The basic meaning of admit card is to help security staff identify the candidates. Students too need to have a look at the hall ticket and check the venue, reporting time, and other details. Lately, the NTA released a notification stating many candidates appearing for the exam in foreign-based centres reported to exam halls as per local time of their respective cities, however, they were supposed to appear for the exam as per the Indian Standard Time (IST). stationery material, textual material (printed or written material), eatables and water (loose or packed), mobile phone, ear-phones or microphone, pager, calculator, DocuPen, slide rules, log tables, camera, tape recorder, to wear/carry any type of watch including electronic watches with facilities of calculator, any metallic item or electronic gadgets or devices. For paper-II, candidates will carry Geometry Box Set, Pencils, Erasers and Colour Pencils or Crayons. Students are not allowed to use watercolour on drawing sheets. JEE Main I January 2019 Exam was conducted on January January 8 to 12, 2019, across all centers in India and abroad. NTA had released the result of JEE main’s paper 1 and Paper 2 on January 19 and 31 respectively. JEE Main has been considered as the admission criteria for admission to Undergraduate Engineering Programs at NITs, IIITs, other Centrally Funded Technical Institutions (CFTI), Institutions funded by participating State Governments, and other Institutions shall include the performance in the class 12/equivalent qualifying Examination. Candidates who qualify the Paper-1 (B. E. /B. Tech.) 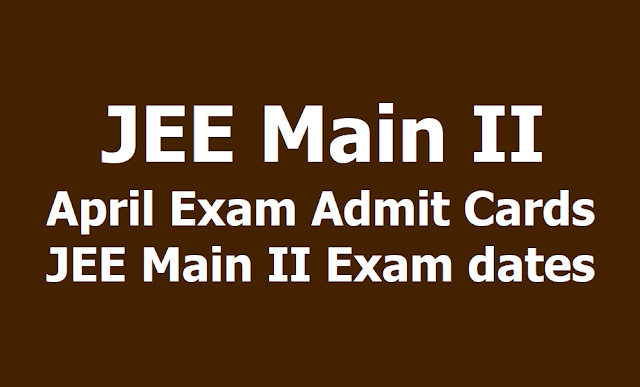 of JEE (Main) will be eligible for the JEE Advanced, which the candidate has to take if he/she seeks for admission to the undergraduate programs offered by the IITs. How to download JEE Main II April 2019 Exam Admit Card?